A graduate of Haskell Indian Nations University in Lawrence, Kan., Veneski is the first student admitted to the Law School from a tribal university. Fletcher, who graduated from Princeton University earlier this year, is the first recipient of the American Indian College Fund Law School Scholarship. The post For Native Americans, a Duo Represents appeared first on Tribal College Journal of American Indian Higher Education. The bill also includes a technical fix for names of Tribal Colleges and Universities. The post Hoeven: 2018 Farm Bill Includes Important Provisions To Support Agriculture In Indian Country appeared first on Tribal College Journal of American Indian Higher Education. The post AIHEC Applauds Passage of the 2018 Farm Bill appeared first on Tribal College Journal of American Indian Higher Education. Last summer on a reservation in northern Minnesota, students from Leech Lake Tribal College earned their solar installation licenses while they dug, drilled and connected five photovoltaic arrays. The post Northern Minnesota Tribe Shows Country How to Do Community Solar appeared first on Tribal College Journal of American Indian Higher Education. On Thursday night at the Keweenaw Bay Ojibwa Community College (KBOCC), eight candidates for Keweenaw Bay Indian Community’s (KBIC) Tribal Council gathered to answer questions assembled by the KBOCC’s tribal government class and student government. The post Candidates Offer Views at KBOCC Forum appeared first on Tribal College Journal of American Indian Higher Education. “You can learn a lot here in a small amount of time.” That is how Oglala Lakota College student Dillon Nelson described his summer doing undergraduate research in food science at South Dakota State University. The post Summer Undergraduate Researcher Increases Knowledge, Confidence appeared first on Tribal College Journal of American Indian Higher Education. 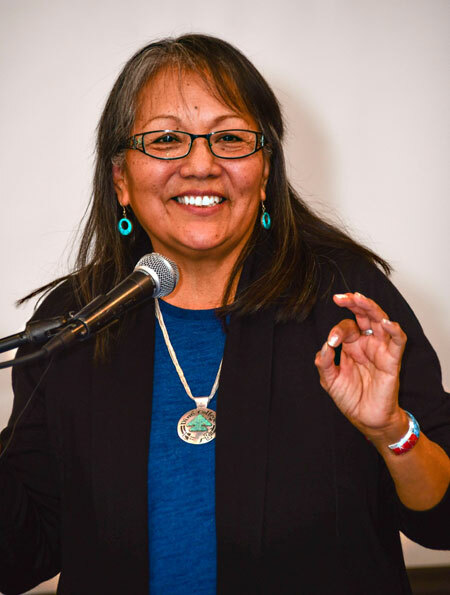 The post Cassandra Manuelito Gives Address to Conclude Diné College’s Anniversary Celebration appeared first on Tribal College Journal of American Indian Higher Education. Four tribal college and university (TCU) faculty participating in the American Indian College Fund’s Mellon Faculty Career Enhancement Fellows Program have graduated. They will now serve their TCUs using their knowledge and new degrees. The post Four TCU Faculty Members Earn Degrees with College Fund’s Fellows Program appeared first on Tribal College Journal of American Indian Higher Education. As the first Native women ever elected to Congress, Sharice Davids and Deb Haaland are heroes for our daughters, role models for our students, and bearers of hope for us all. The post Thank the Creator for “Radical” Native Women appeared first on Tribal College Journal of American Indian Higher Education. The Press went dormant in the late 1990s, but current Diné College President Monty Roessel confirmed that things should be back in the fore in a matter of time. The post Diné College to Re-Establish College Press appeared first on Tribal College Journal of American Indian Higher Education.